Photo courtesy of Don Borin/Stop Action Photography Mercer Island senior outside hitter Adara Hamilton has been on the varsity squad since her freshman season in the fall of 2014. Consistency has defined Mercer Island volleyball player Adara Hamilton ever since her freshman year of high school in 2014-15. Hamilton made the Islanders’ varsity team in the 2014 season as a freshman, which is a rare feat in the world of high school volleyball. 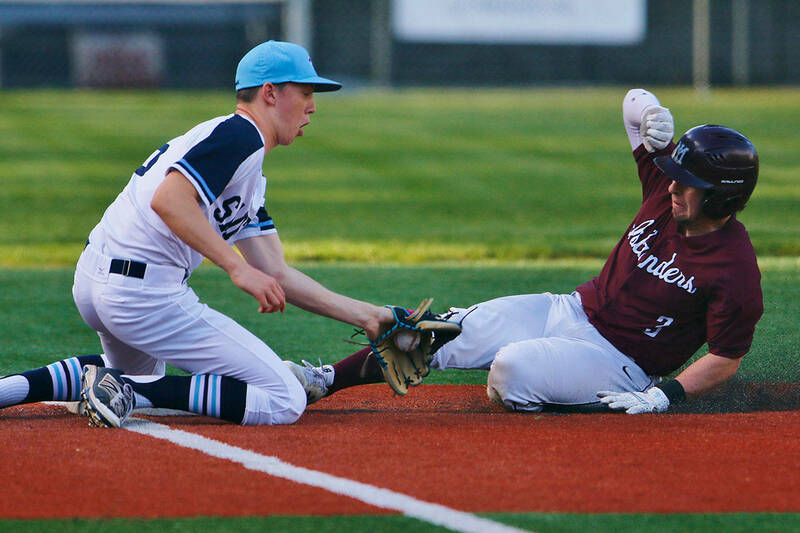 “It was kind of intimidating because [Mercer Island] won state (2013 Class 3A state champs) the year before. I think being a part of this team over the years has made me a better person and a better player because it teaches me to work as a team,” Hamilton said. Hamilton is a huge fan of Islanders head coach Susan Rindlaub and assistant coach Kelly-John Lewis. The Islanders, who finished the 2017 regular season with an overall record of 15-1, are looking forward to postseason play. The Class 3A Sea-King district tournament will take place from Nov. 1-4 at Sammamish High School in Bellevue. The Class 3A state tournament is scheduled for Nov. 10-11 at the Toyota Center in Kennewick. “We want to win districts, make it to state and hopefully win state,” Hamilton said. Two clutch victories against the arch-rival Bellevue Wolverines during regular season action have provided the Islanders with an abundance of confidence heading into postseason play. Mercer Island earned a 3-1 victory on the road against the Wolverines on Sept. 20, and came up with a clutch 3-2 win in a five-set thriller on their home court on Oct. 16. Bellevue finished the 2017 regular season with a 13-3 overall record. “When we played them here (MIHS) it went to five (sets). We were losing 9-2 in the fifth set and I think the reason why we won was because we didn’t give up. What we did was just focus on our side of the court. We executed and we went on runs,” Hamilton said. Hamilton will continue her volleyball career at Division-III Wheaton College in Norton, Massachusetts in 2018. Recently the Mercer Island Reporter had an opportunity to ask Hamilton a few questions about her life outside of the volleyball court. Adara Hamilton: It is probably “Titanic.” I think it is just a well made movie. I think the acting is really good. I like the actors and the actresses. MIR: What is your favorite restaurant on Mercer Island? AH: Mo’s Pizza. It has pizza that is spicy and sweet at the same time, its called the volcano. It has pineapples and jalapenos on it. AH: The Dallas Cowboys. I was born and raised in Dallas, Texas and I went to a bunch of Dallas Cowboys games. It was really fun. AH: It is actually the word pet peeve. I don’t know why. The word to me is pointless. I don’t like it. It is just annoying to me. MIR: Who was your idol growing up? AH: It is probably my mom. Having to go through a divorce and tough times, watching her handle that made me a better person. MIR: Where do you see yourself in five years? AH: Hopefully graduating college, getting a job and a place to live. AH: Zac Efron. He is really pretty.